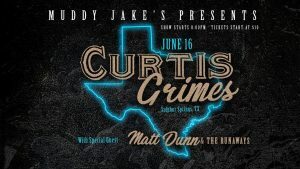 Muddy Jake’s is excited to announce they will have Curtis Grimes here in Sulphur Springs! He will go on at 9:30, following Matt Dunn & The runaways @ 8:00! Tickets are on sale on Eventbrite, and will be $5 cheaper than day of tickets. Curtis Grimes is pretty big on the Texas Country music scene. He’s known for his hits “Irresponsible” and “Smile”. Mark your calendars! It’s not often that we get bands this big in our small town!